The Robson Square ice rink opens for the season on December 1st, providing affordable family fun in Downtown Vancouver throughout the holidays and beyond. Skating is free with your own skates, otherwise rentals are available. The rink also features a concession stand with snacks and warm drinks. This year Vancouver’s 50th foot Christmas tree will also be located at Robson Square. Enjoy free holiday entertainment from December 13th to 24th with local bands, singers, and entertainers on stage next to the rink. *Helmet included with skate rental. Cash only! Watch here for updates or call the Robson Square Hotline 604-646-3554. Please be advised that warm weather leads to warm ice! Robson Square Ice Rink may need to close unexpectedly. If you are a grade 4-7 school, you can enroll sign up for free skating at the Robson Square Ice Rinks school program. 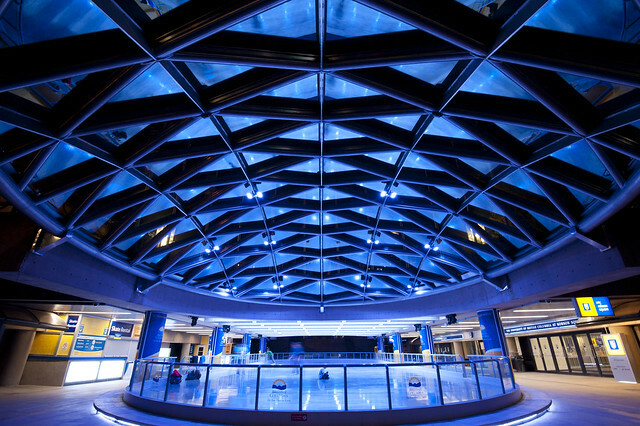 Robson Square will provide your class with free skate and helmet rentals. The school program runs Monday through Friday with three 1 hour time slots daily. The The Robson Square ice rink will remain open until February 14, 2017. Tag your photos with #robsonsquare on Facebook, Twitter, and Instagram to share the fun. Robson Square is located at 800 Robson Street between Robson and Georgia, Howe and Hornby. What will be your hours on new years day? Do we know if free wedding officiants will be provided this year on the 14th courtesy of Pop Up Weddings?